I work at an airline as a pilot and I am involved in the "paperless" project which aims to have no more paper in the cockpit - all the data should be accessible from tablet devices. We have a lot to read during flights (checklists, rules and regulations, maps and so on). We will have special screens (size of about an iPad) but with a higher resolution (1280x1024). What's the best color combination considering night/day conditions? And what's the best font to read on screen? My personal history shows that I work mostly with classic black on white contrasts (as a developer and as a consumer). We already have a software product which allows the pilots to switch to "night-mode" which inverts the most colors, however almost nobody uses the feature. The reason why I don't switch to the "night" mode is mainly because we can dim our device perfectly so there is almost no glow which distracts us during flight and we have the cockpit lights on during cruise. Airbus Industries started to ship their electronic software with the default setting set to white on black (with the option to switch). I ask myself if they did it only to be conform with the cockpit displays (CRT/LCD mixed, only white on black)? Lufthansa Systems has a complete system which is by default black on white. I am not aware of an option to switch it into night mode in general, except the navigation maps. Personally I think it's important to have an eye on the web industry, as by today almost everyone is involved. We read, write and learn in the web - and it's mostly black on white. This could be the reason why most people think white on black is odd and won't use it if made available as an option, because it's not a common standard. So why should we force the user to white on black? The current choice would be Tahoma 12pt, #222 on #fff with the option for #fff on #000 according to Michael Zuschlag's answer and references. Hall RH & Hanna H 2003. The Impact of Web Page Text-Background Color Combinations on Readability, Retention, Aesthetics, and Behavioral Intention, Laboratory for Information Technology Evaluation, Technical Report LITE-2003-04. For indoor web use you might get away with any reasonably dark-and-light color combination. However, considering the possibly harsh and highly variable viewing environment of the cockpit, (e.g., totally dark night to low sun shining directly on the display), you probably want go with black and white. I believe whether black-on-white or white-on-black is better depends on the font design. Most fonts for personal computers are designed for dark-on-light presentation. If you’re using “regular” computer fonts, you probably should go with black-on-white. However, depending on the performance of your device when dimmed, you might want to consider white-on-black for night mode to maximize visibility of everything else the pilot needs to see. See answers for White font on black background. Bernard M, Mills M, Peterson M, & Storrer K 2001. A Comparison of Popular Online Fonts: Which is Best and When? SURL Usability News 3(2). Bernard M, Lida B, Riley S, Hackler T, & Janzen K 2002. A Comparison of Popular Online Fonts: Which Size and Type is Best? SURL Usability News 4(1). Black text on a white background yields the best legibility, since the bright glow from the background causes your pupils to contract. It's easier to focus your eye with a smaller pupil (much like the depth of field is increased with a smaller camera lens), and it reduces the effect of refractive errors in the eye. For situations where you don't want to destroy your night vision, a dark background and red or amber text is most comfortable. Personally I dislike high contrasts with light text on a dark background, so I use colors like 'wheat' on 'dark slate gray'. For dark text on a light background, I find a warmer color is more relaxing. Many e-book readers and text editors use an off-white yellowish tint to good effect. I've been working in a project called eAdept (www.eadept.se) with an application for screens on mobile phones for users that are visually impaired. We've been trying different combination, both indoors and outdoors to find find out what's best for these persons. We've also been talking to, for example specialists and supervisors to visually imapired to get a good explanation of the interaction between differens colors. The result of all these test and information is a combination of yellow and black. We've been using #F8EF20 for the yellow one and also some darker and lighter versions. Maybe a combination like that can work in a cookpit. Well I'm not an avid book reader, but I am a programmer and I look at text all day. For me text is a tool. I started programming with notepad black and white and it really wasn't all that great. Today my workshop looks like this. This is highly tailored to my preferences. In low light environments I strongly prefer light on dark, and I suspect most others do as well. The iphone's maps as well as tom-toms seem to embrace this in their UX where they automatically switch over to a different color theme at night. I'm not a scientist, I don't know how that works. I just know that I like that they do that. It could be different for light emitting screens vs light reflecting surfaces, such as a monitor vs an eInk screen. I love eInk and always prefer to read in well lit environment with either eInk or paperback. When staring at a monitor all day however, especially in a low light environment, light on dark all the way. I find dark on light from a light emitting screen especially harsh on the eyes in the morning before I'm really awake. 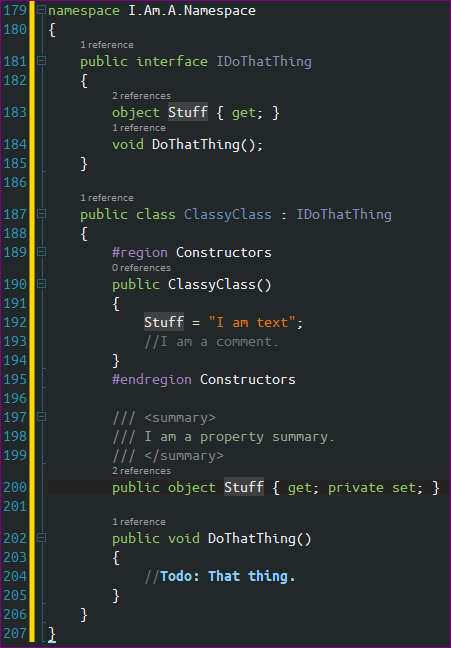 Getting back to my code example, code is highly structured and there is a correct way to interpret what you are reading. Even still, color assists greatly in comprehension. When reading a book, how many times have you had to go back to refresh your memory of the context of what was written, or the perspective from which it was written? These are some areas where I think color can greatly assist. Just something to think about. To make your work readable, consider san-serif fonts for devices. Serif fonts are preferred when working with print-design because the user is expected to read for a long time. When time is an issue, go to Serif fonts like Baskerville. Otherwise, stick with sans-serif for small-sized text and articles. Also, know that sometimes your typography may be flawless, but your WHITESPACE is poor. Design needs white space. The eye needs to rest, otherwise your user will get tired and leave the page or miss important information. Another interesting point of research, especially since your question is about screen reading, is Amazon's Blue Shade. With this, as the name implies, Amazon makes the color of the screen "warmer" and reduces the amount of blue on the screen, in an effort to have healthier viewing in low light. Amazon create the technology because of a study published in the United States National Institute of Health stating that tablets reduce human production of melatonin and reduce ability to sleep. Not the answer you're looking for? Browse other questions tagged color color-scheme typography or ask your own question. How does background,text colors affects user's experience in reading?